The Education Summit promised by the Parti Québécois is only weeks away. Universities, student associations and the Education Minister are gearing up in a context of recent cuts to education for this fiscal year. The fight over universities’ funding is recurrent in Quebec, and similar summits have happened before. 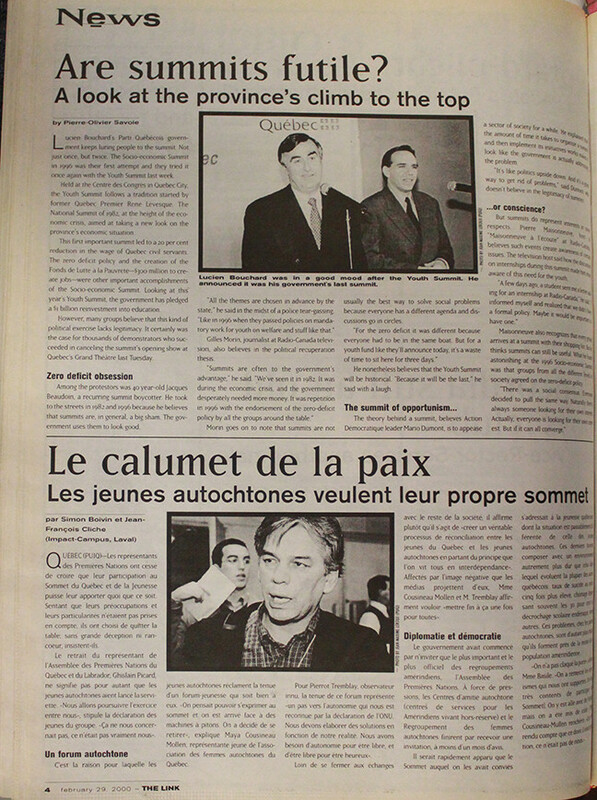 In February 2000, the Bouchard government decided to organize a Youth Summit in Quebec City. But the summit didn’t happened as planned. When students showed up around the Centre des Congrès, the police tossed a copious amount of tear gas canisters (at least 20 according to The Link ’s reporter). In response, some students starting throwing rocks and other objects at the police, resulting in complete mayhem. While the police claimed the students initiated the confrontation, footage of the incident proved otherwise. 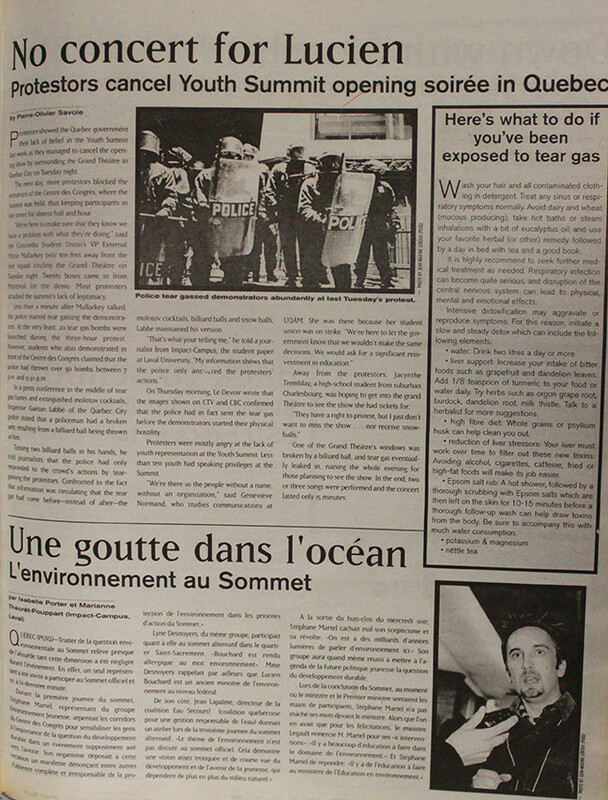 “On Thursday morning, Le Devoir wrote that the images shown on CTV and CBC confirmed that the police had in fact sent the tear gas before the demonstrators started their physical hostility,” wrote Link reporter Pierre-Olivier Savoie. 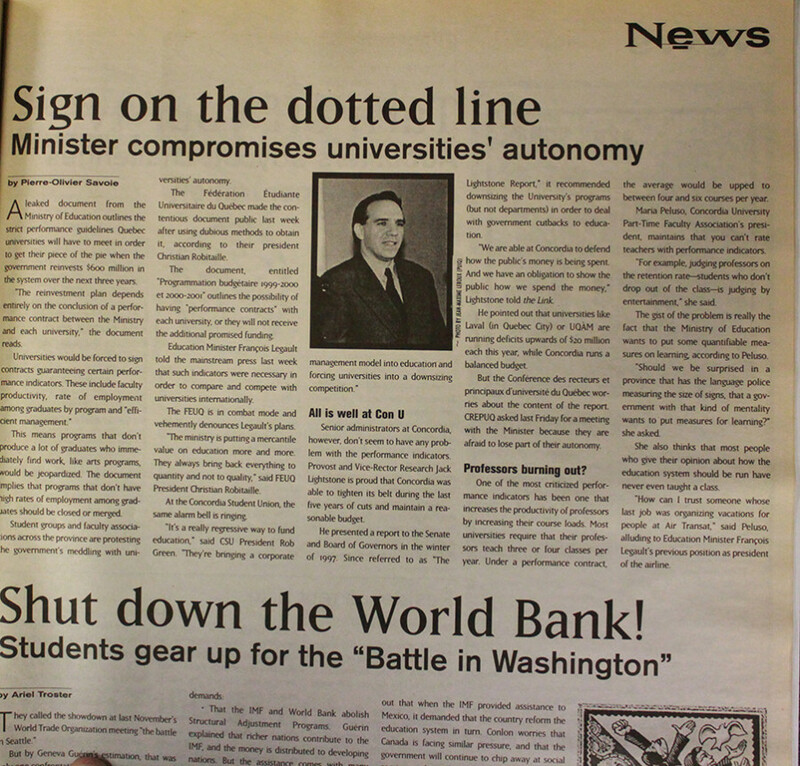 The students were protesting the summit, which they saw as a PR stunt by the government since a very limited number of students were allowed to speak. “Premier Lucien Bouchard might love them, but summits are not a healthy way to govern a society. And this week’s Youth Summit provided further evidence . Lobby groups haggled behind closed doors,” wrote Josée Legault in The Gazette following the end of the summit. 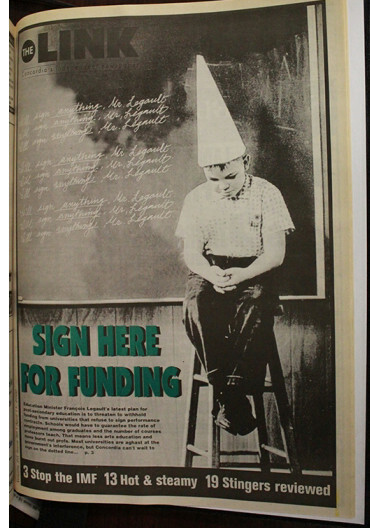 In April 2000, The Fédération étudiante universitaire du Québec leaked a document from the Ministry of Education revealing a new plan to tie a university’s funding to their performance. The schools would have to sign “performance contracts” directly linking numbers such as employment rate amongst recent graduates, to the level of funding received. The proposal generated a lot of anger among professors and students in most universities—except within Concordia’s administration. Cue this cover by The Link. Let’s hope the upcoming summit goes better than this one did.